As of September 1st: Final deadline for Registration is the end of Friday, September 9, 2016! Edit July 26: There are a few remaining openings for triple, quadruple, and quintuple rooms. Single or double occupancy rooms are no longer available. Now that we are getting closer to the event, we wonder if your schedule has opened up. Can you join us? We’d love to have you! When you fill in your registration, please let us know whether you have rounded up your own roommates, or if you would like us to help you. At this date for the remaining spots we are more than happy to facilitate meeting new friends whenever we can. Just indicate your wishes on the registration form. Regarding your class choice, which you will indicate on the form, please know that at this date there are still openings in Carson’s Saturday morning and afternoon classes, but the rest of the sessions are closed. Download the 2016 Glamping with Plucky Registration Form. We strongly recommend opening this file with Acrobat Reader DC, which is a free download. As some tablets do not support filling out PDFs, we suggest you open the PDF on a desktop or laptop computer. Fill in all applicable fields then save the filled in PDF in an easy to find location. Please note that the class options have narrowed as some are full. Open seats remain in Carson’s class, so indicate your time preference 1, 2, and 3. Also remember the guest rooms for singles and doubles are sold out. Email the attachment to lorilee@city-knitting.com at the registration date and time. Download the 2016 Glamping with Plucky Registration Form. We strongly recommend opening this file with Acrobat Reader DC, which is a free download. As some tablets do not support filling out PDFs, we suggest you open the PDF on a desktop or laptop computer. Fill in all applicable fields then save the filled in PDF in an easy to find location. Email the attachment to lorilee@city-knitting.com at the registration date and time. Note: Please do not fill out the PDF in your web browser. Many browsers do not support the saving of filled in PDFs, and all your effort will be lost. 1) Fill out the PDF, print it, and either scan or take a great photo of it with your smart phone. Send the scan or photo as your email attachment. 2) Print out the blank PDF, fill it in by hand, then scan or take a photo and email the scan or photo. This year for the annual Plucky Knitter event we’ll gather in a retreat setting on Bainbridge Island, a short ferry ride from downtown Seattle, Washington from Thursday evening dinner through Sunday breakfast, September 29 – October 2, 2016. We are so excited for this unique opportunity to see you all again! 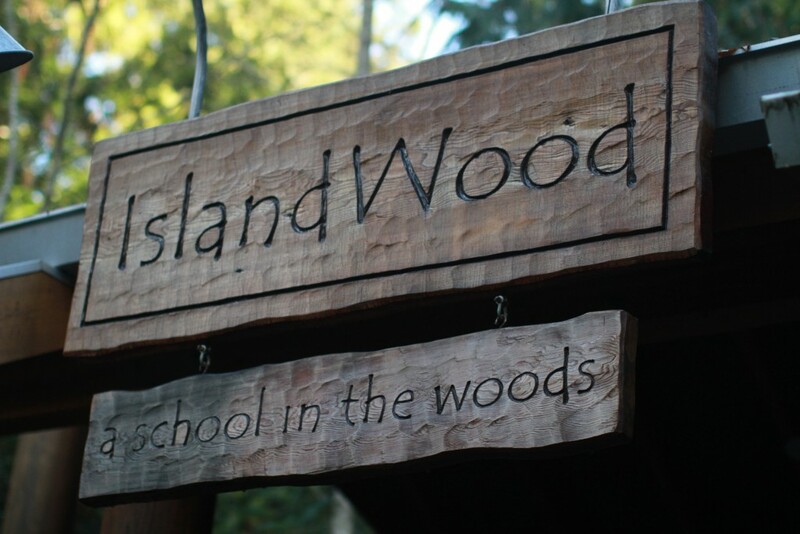 IslandWood is an environmental education, not-for-profit organization. Every year this 250 acres of Pacific Northwest woodland hosts 12,000 students. It was opened a little over a decade ago. Its spectacular green architecture will certainly inspire! During the week, students are led by graduate students in their learning. On the weekend, groups like ours come in for meetings and retreats. The entire campus will be ours alone! We only need to share with the towering firs! Take time to enjoy the trails among acres of Pacific Northwest splendor. Sit and knit by the fire in your lodge’s great room. Wander and explore. We are thrilled that west-coasters Janine Bajus and Carson Demers will be joining us as instructors! There’s not much more thrilling than color work in knitting, and not much more important than taking care of our bodies through learning and relaxation. Spending time with Janine and Carson will be a valuable investment in our future knitting happiness. When Lorilee visited IslandWood during a public tour, she could not stop picturing the place filled with knitters and kept telling me how lovely it was. So, of course, Hayley and I visited because we just had to see for ourselves how wonderful IslandWood is! And WOW, she was right! We were completely enchanted by the gorgeous surroundings with miles of trails lined with moss covered trees. With its large fire pit, the Friendship Circle had us dreaming of sitting around the fire on a crisp Fall night filled with friends, knitting and s’mores. The staff at IslandWood is looking forward to serving us! The charming lodges that will welcome us all back after a day of class, knitting, and shopping are the perfect place for ending the day in front of the huge stone fireplace knitting in your p.j.’s. There are four lodges for us to sleep in, each with its own shared great room with fireplace. All are within close strolling distance, so visiting lodge to lodge is easy. There is an education wing where knitting class will be in session, and a separate building with a great room for All THE YARN and hanging out! 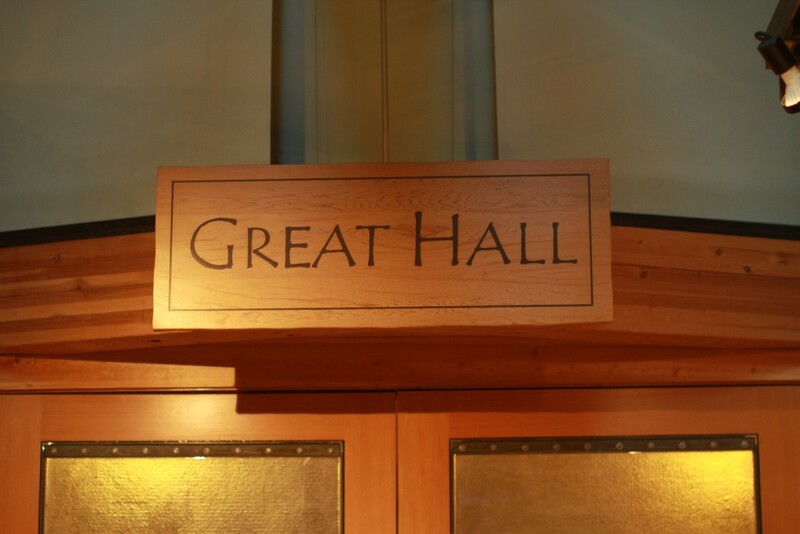 We think you’ll love the dining hall as well. Imagine 160 of us all taking our meals together family-style! Please read the Q&A that follows the class descriptions, and let us know if we have left anything unanswered for you. We know it is lengthy but we tried our best to think of all the possible questions you may have! We truly can’t wait to see you all in this gorgeous, serene setting. Although different from our past gatherings, we truly believe you will not be disappointed in IslandWood! 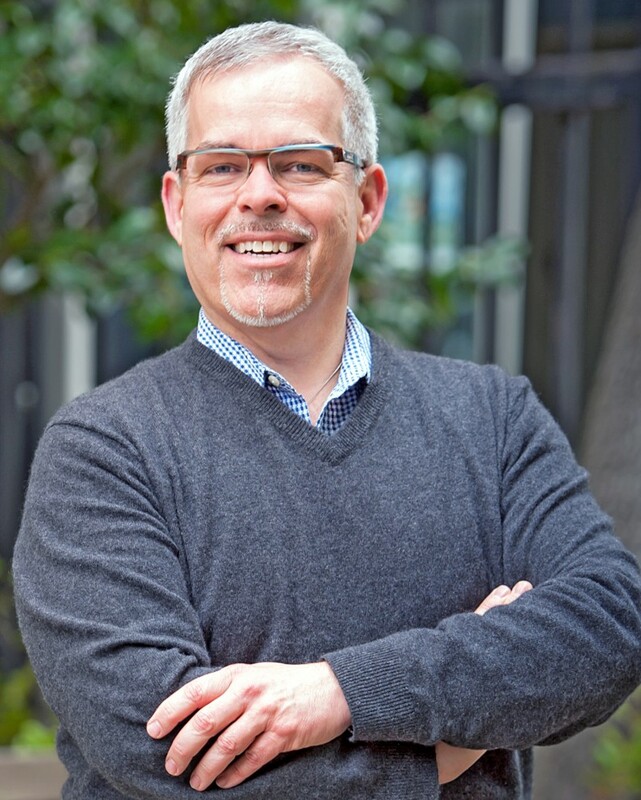 By day, Carson is a physical therapist who runs an ergonomics program for a San Francisco Bay Area medical center. Every other moment, he’s knitting, spinning, designing, teaching, writing, or otherwise up to some fiber fun with a watchful eye toward ergonomics. 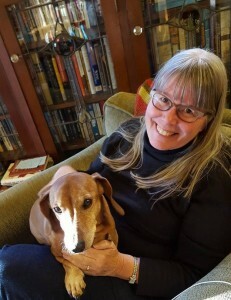 His passion and experience in fiber arts combine with his expertise in physical therapy and ergonomics to create a unique skill set that he eagerly shares with the fiber community at local yarn shops, guilds, and major knitting events across the country. He is a regular contributor to Ply Magazine. His aim is to keep us all creating healthfully and comfortably ever after. Ever know a knitter who hasn’t said, “Just one more row”? Me neither! I’ll bet they’ve also complained of aches and pains while knitting. In this class, you’ll learn how knitting affects the “fabric that makes the fabric”- your body, and see how knitting technique impacts your efficiency and productivity. By completing a Risk of Injury assessment in class you’ll learn how knitting contributes to those aches and pains throughout your body. But more importantly, you’ll learn how to reduce them. A little knowledge and some simple changes can keep you knitting comfortably and safely ever after. Students who’ve taken this class have said that it should be “required learning for all knitters regardless of experience level!” and, “it’s as important as the knit and purl stitches!” This class is taught by a passionate knitter who is also a physical therapist. This class is not an individual knitting assessment. Materials: Students are asked to bring a knitting project of their choosing, a bath-sized towel, and materials to take notes if they wish to do so. Required skills: Class is suitable for all levels of knitting experience. 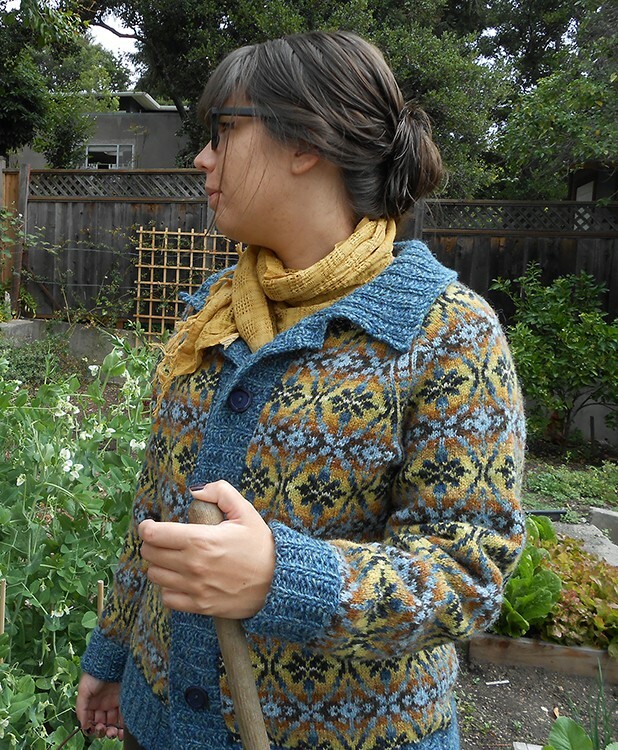 Janine Bajus (AKA Feral Knitter) has been intrigued by Fair Isle colorwork knitting since she received a patterned yoke cardigan from Shetland in 1964. 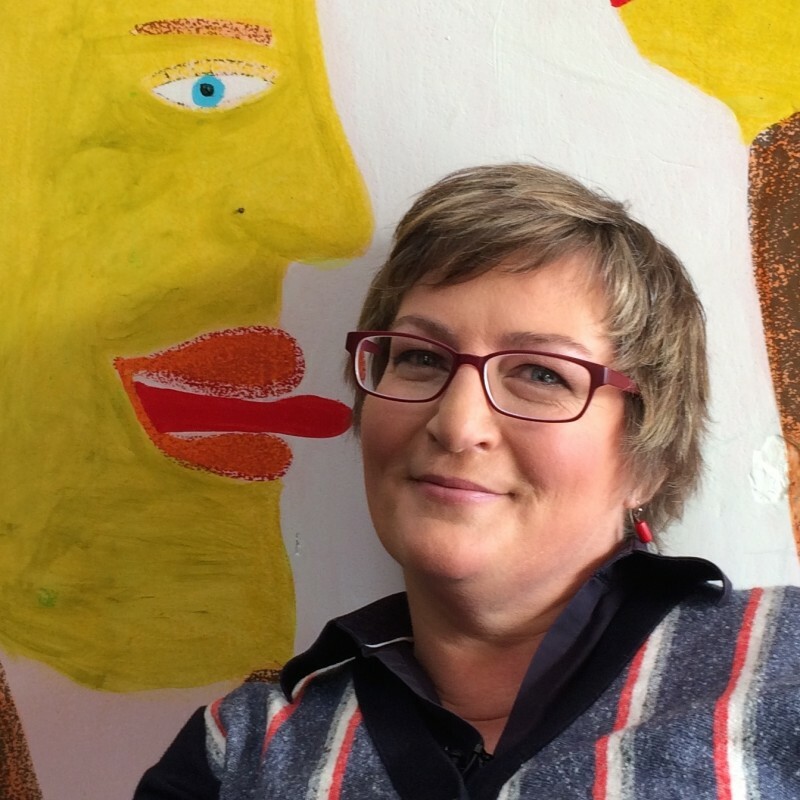 Playing with color has remained the theme of her fiber life ever since. She teaches workshops around the country and loves introducing others to the joys of modern Fair Isle knitting. 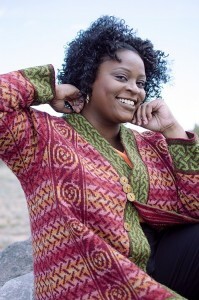 Janine sells yarns and designs patterns for people who are similarly besotted from her home in Berkeley, California. Her dachshund Mason is not much help. Her book, The Joy of Color: Fair Isle Knitting Your Way, will be available in September 2016. Intrigued by the color play in Fair Isle knitting? Wondering how designers decide which colors go where? Well, it’s time for you to plunge in! This class will start with a short discussion about how value gradients and mirroring make color use in Fair Isle knitting different from other stranded knitting traditions. Then you will start knitting a traditional Fair Isle hat of your own! You will have a yarn pack containing several choices of colors and enough Plucky Knitter Oxford to complete two hats. Beginners can follow the chart as written for their first hat; those who want to try their hands at arranging colors can fill in the colors as they choose. A blank chart and motifs that can be placed as wanted are provided for the adventurous knitter who wants to personalize both color and motif. For success in class, we decided it was necessary to divide and prepare yarn packs for class. We would not want to require you to purchase seven skeins of Oxford, but we do want you to have that many colors! You will have color choices and enough yarn to complete two hats, so will require a materials fee of $35 for this class. If you are registered, the fee will be added to your Glamping invoice. 16” circular needles, size US 3 (3.25 mm). If you are a loose knitter, size US 2 (3.0 mm); tight knitter, size US 4 (3.5 mm). Required Skills: Some experience with stranded knitting in the round (you don’t need to be an expert—I’ll give you pointers). Tent-camping with her husband and boys has brought Lorilee to over twenty National and Provincial Parks. Lorilee grew up in Pittsburgh, spent thirty years in west Michigan, and now calls Seattle home. Lorilee is the Techniques columnist for Knitty.com, a Craft Yarn Council certified knitting instructor, a TNNA designer/teacher member, and an instructor at Craftsy.com and Interweave as well as national knitting events. Her articles and designs have been published in The Ultimate Hat Book, Blue Moon Fiber Arts Rockin’ Sock Club, Vogue Knitting Magazine, Interweave Knits Magazine, Interweave Sockupied eMag, Twist Collective, and Beyond Toes. When you learn continental knitting, you will minimize your hand motions for a more comfortable, and perhaps speedier, way to knit. Each finger has a job to do. Understand exactly what motions have a bearing on stitch gauge. (It’s not what you think!) Learn to create even knitting by sizing your knits and purls equally. Learn how your choice of tools affects your outcome. Practice the knit stitch then move on to purl, increases, decreases, and ribbing where efficiency really pays off. 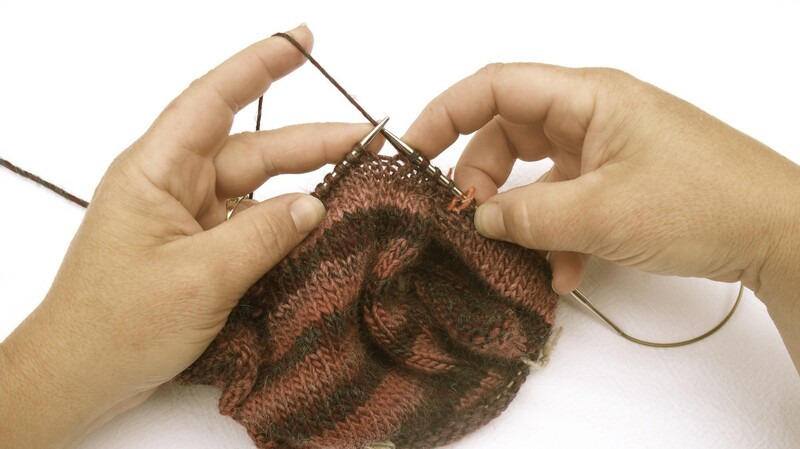 Beginning knitters and experienced knitters are equally welcome in this class! Yarn- About 50 grams of a 3 or 4-ply wool or wool blend. Worsted weight. Nothing splitty or fuzzy. Choose colors that are easy to see. Needles- Slippery circular needles are best for this class. Bring one circular needle 24 – 32 inches long in a US 5 to 7 (3.75 – 4.5 mm). Gauge is not critical for class. If you already know how to knit in any style, cast on 24 stitches and work 4 ridges (8 rows) in garter stitch. Then switch to stockinette stitch (knit one row, purl now row) for about 2-3 inches. Do not bind off. Bring work to class on the needles. Beginners get a pass on the homework. Students will be crocheters who want to learn to knit, brand new knitters, knitters who have been using another styler for decades, or those who can knit continental, but haven’t quite committed to it. All are welcome, and we’ll all be learning anew together! 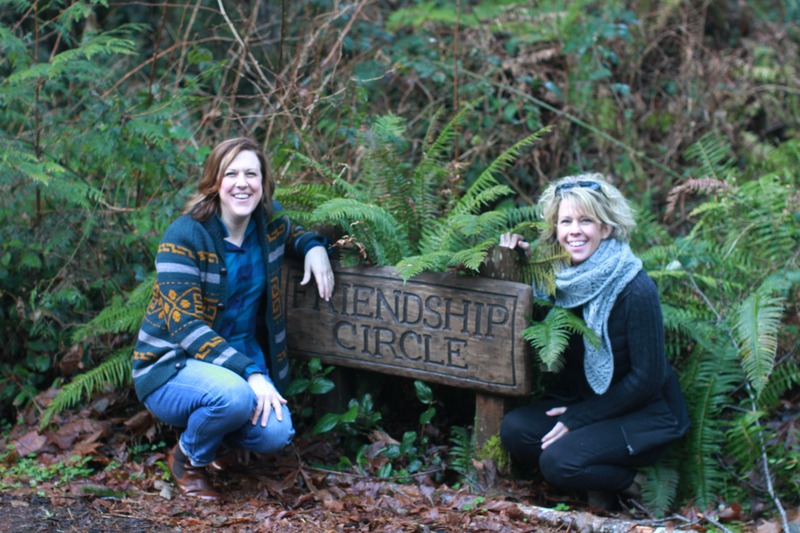 We are so excited to gather in the woods on Bainbridge Island! Whether attending as a registered Glamper, or planning to visit for shopping and hanging out, you may have questions about the weekend. This document is lengthy, but please read through the Q&A below. We want to provide you with as much info in one place as possible and will update it as necessary. Thursday evening suppertime (about 6:00 p.m.) through Sunday breakfast (about 10:00 a.m.), September 29 – October 2, 2016. Shopping, classes, and events are Friday and Saturday. Bainbridge Island, a short (and lovely!) ferry ride from Seattle, Washington. IslandWood is the event venue. Here we will refer to confirmed registered retreaters as “Glampers” and those attending but not staying on site as “Visitors” – and very, very welcome visitors! The Plucky Knitter Crew – Sarah, Hayley, and the fellas will be there serving up the yarn and the fun. Lorilee and her crew of two will serve you at the registration desk and help you with the details. Janine and Carson will take good care of you in the classroom. There is no fee to attend as a Visitor. Shuttle transfers to and from the Bainbridge Island Ferry dock. Private event access. This lovely campus is rented for our group only. Enjoy the trails among acres of Pacific Northwest splendor. Sit and knit by the fire in your lodge’s great room. Wander and explore. Optional facility tour led by IslandWood docents. Shopping in the Plucky Knitter Marketplace on Friday and Saturday 10:00 a.m. – 5:00 p.m. Exclusive Glampers-only shopping from 10:00 a.m. to 1:00 p.m. on Friday. Planned evening activities- reception, bonfire, fashion show. One three-hour class session from a choice of three options. Three nights accommodation. Guest rooms are described below. All meals Thursday dinner through Sunday breakfast, served family style, with attendees’ dietary needs met by the chef. Drink service. Coffee, tea, and drinks available Friday and Saturday. 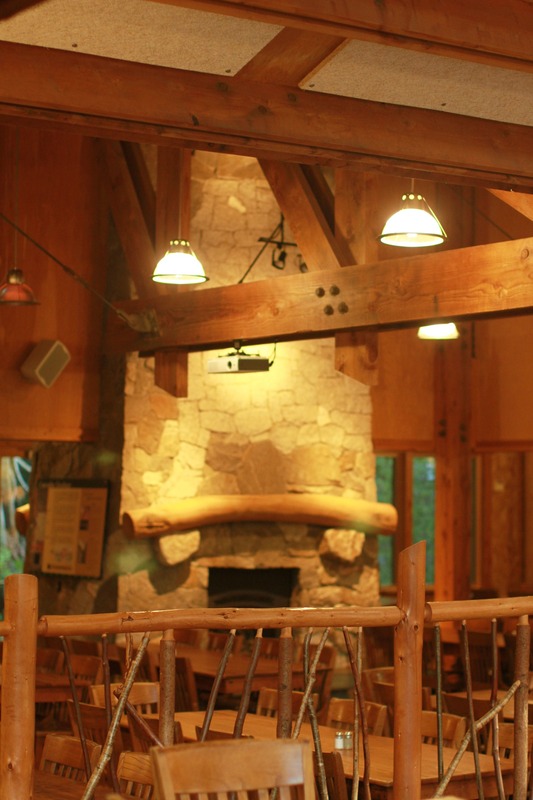 There are four lodges to house us, each with its own shared great room with fireplace. All are within close strolling distance, so visiting lodge to lodge is easy peasey. Each guest room has its own bathroom with the toilet and shower each behind privacy doors. All linens and towels are provided. 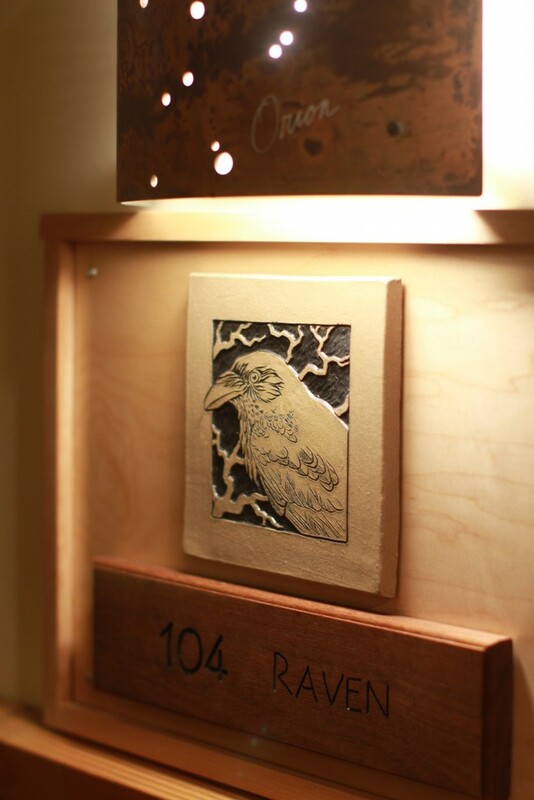 The furniture is beautifully made by local craftsman from timber harvested on site. Each bunk has it’s own reading light and window to gaze at the gorgeous outdoor scenery. The buildings we enjoy are all LEED certified green built and new construction. There are soaring spaces with lots of natural light. Guest rooms are for Glampers only. We have room for 160-162 guests. Single occupancy rooms- $1,150. Room has one queen bed. There are two rooms available. Double occupancy rooms- $1,025. Room has one queen bed. If you choose this I will ask you if you prefer one queen bed, or two twins.There are two rooms available. Triple occupancy- $925. Room has four twin mattresses configured as two bunk beds. One bed will be left unmade. There are about 16 rooms available. Quadruple occupancy- $850. Room has four mattresses. Two bunk beds – each with a queen below and twin above. There are about 16 rooms available. Quintuple occupancy- $775. Room has five mattresses. Two bunk beds with twin mattresses and one separate queen bed. There are about 8 rooms available. Additional fee $35 for a yarn pack only for students in Janine’s class. We will not be assigning roommates. Please see registration instructions below. Q: How will registration work? How are you guys going to sort it out on your end? How many of us can come? Please give us some instructions. – We have room for approximately 160 Glampers, up from 110 in previous years. – Decide what room configuration suits your needs. Gather the number of roommates you need to fill your guest room. Each individual fills out their own registration, but each lists their roommates on that form. This Ravelry thread will help: “Roommate Plans for Glamping with Plucky, 2016, Seattle area”. Find the discussion in The Plucky Knitter group. – Your window to register opens Thursday, February 25, 9:00 PM ET and closes 24 hours later on Friday, February 26, 9:00 PM Eastern Time. – A few days before registration we will provide a PDF for you to fill in at your leisure. You’ll find a link added to this blog post, and we will also share it in post #1 in the Ravelry thread “2016 Shindig Chat & Information | Seattle, WA”. Find the discussion in The Plucky Knitter Group. – We’ll ask you everything we need to know – your preferred room, your pre-arranged roommate(s, if any), your choice of class (prioritized, first choice, second choice, and so on), shirt size, food allergies, mobility concerns, contact email, shirt size, Ravelry handle. – Fill out the PDF form. We will provide more specific instructions with the PDF, but know you will be able to fill it out ahead of time, so that when registration opens it does not boil down to a race to see who can type the fastest. – Communicate with your planned roommates so you are are all “thumbs up” and ready to go. – When registration opens, follow the instructions on the form to email your registration. – During the day of registration, unless your email bounces back to you, you can assume we received it, but will also do you the courtesy of sending a quick reply that your registration has landed. That is all you will hear from us that day as we will have a lot of organizing to do! – Then we ask for patience, as we have a manual process to go through. Please and thank you! – Over the weekend, we will sort your registrations. The person in your group who sent their email the soonest will win the time stamp for the entire group. Then we have to place you in the rooms available to us. Like we mentioned, this is a manual process. – We may contact you during that time if we have any questions. We promise to be fair and conduct everything as we say we will. No shenanigans here! – We will also form the class lists. – On Monday, February 29 we’ll email everyone who registered to let you know your results, room assignments, and class. This will be a day of gladness and sadness. Believe us, we’ll share those emotions as well. – We’ll also email an invoice with instructions for payment in full which will be requested within a few days. Your payment confirms your place. Q: What do I have to do between now and registration? A: You need to ask yourself: Am I free those dates? Can I swing it? Do I want to try to come? We hope the answer is YES! If you are willing to share rooms, if you are willing to put yourself out there to find roommates before applying, and if you understand it is likely that some who want to attend will not be able to due to our limited capacity, please read on. If you do not want to sign up for the package deal, but just want to visit, please continue reading. There is information here for you as well! Q: How do I find my own roommates? A: Partner with Plucky Knitter friends and perhaps strangers, what we call soon-to-be-friends, to register as a group. This Ravelry thread will help: “Roommate Plans for Glamping with Plucky, 2016, Seattle area”. Find the discussion in The Plucky Knitter group. Post what you are looking for and use personal messaging on Ravelry to connect. Once you have your committed group, I recommend you share email addresses and communicate that way. Q: Why can’t we register first and make our room group later? A: Due to the behind-the-scenes details of this particular event and the accommodations at the venue, we made the decision as organizers to use this method. We understand there may be up-front concerns regarding this method, but more complications arise if we organize roommates after the fact. We want the decisions of whom you share your space with to be yours! Q: Does this pre-grouping method increase or decrease our chances of getting in? A: The answer is that it is too difficult to predict. We do have more spots available (160 instead of 110) compared to previous years. This may feel a bit like a lottery, even though you have an opportunity to increase your chances by having at least one person in your group be speedy. Q: What if our group (of 1 – 5) does not get in? A: If that happens, we are very sorry, but you may opt to build on your relationship established thus far. Perhaps decide to come as Visitors, sharing a hotel room in the area and coordinating on a rental car. Please read on because that can also be fun! Which room will you be staying in? Q: Where do I stay? A: Glampers are housed on site. Out of town Visitors will make their own arrangements for hotels in the area, and decide where they want to stay on or near Bainbridge, or even in Seattle. Q: Can you tell us more about what the guest rooms are like? A: The entire facility is LEED certified green building, and it is all new since 2010. The architecture is inspiring. It is ample and comfortable. If you are picturing rustic camping cabins, you have the wrong idea. So, for instance, floors are polished concrete, but the beds are handcrafted from trees felled on the property. Linens are very lovely. And each bed has a little window for a personal view to the outdoors. The IslandWood campus has lodges. The entire facility is ours for the duration. Each lodge has guest rooms and its own great room. The great room has a fireplace and ample room for hanging out. Each lodge also has a washer/dryer, and one refrigerator. Each guest room has the configuration of beds you signed up for, and storage. The bathroom in each room is configured as follows: a sink open to the room (not private), a private toilet with a door, and a private shower with a door. Soaps are provided, shampoo is not. Sheets and towels are provided. Glampers may tack on additional nights to stay in the area, but not at IslandWood. You will need to make your own arrangements at area hotels, as we must all check out on Sunday morning. Remember this is a not-for-profit organization that serves students during the weekdays. Q: When can we arrive? What happens on Thursday? A: Glampers will schedule their arrival on Bainbridge Island for some time after lunch on Thursday, Pacific Time. Please eat lunch before you arrive. Local Glampers can drive all the way to IslandWood, or be picked up by our crew at the Bainbridge Ferry Dock. We will shuttle you and your luggage, or will try to make it possible for you to visit the charming town of Bainbridge while we take your luggage ahead to the venue for you. We’ll be watching the ferry schedule and making multiple round trips so you can come and go. Glampers will want to be at IslandWood by suppertime Thursday, although we can pick folks up from later ferries if necessary. Aside from dinner, served family style, there will be no major events scheduled that evening. We’ll have time to just relax, explore the gorgeous surroundings, settle in, and get to know one another. On Thursday the Plucky Crew will be setting up shop all day, and in the evening, relaxing like the rest of us. Visitors- We have no scheduled activities for Visitors on Thursday. Q: What happens on Friday? A: Friday kicks off the festivities! Glampers will have breakfast together family style. Then the Plucky Market opens from 10:00 a.m. – 1:00 p.m. for Glampers only, although Glampers will also want to get lunch toward the end of that time. After family style lunch the Glampers-only time ends, and all Visitors are heartily welcome to come to the Market from 1:00 p.m. – 5:00 p.m.
Class is in session from 2:00 p.m. – 5:00 p.m.
At 5:00 p.m., Visitors need to say good-byes until the next morning, while the Glampers move toward supper and our evening activity. Q: What happens on Saturday? 10 a.m. – 5 p.m. Glampers have an evening activity. More details on that will be updated later. Visitors may shop between 10 a.m. and 5 p.m. It is important to understand that IslandWood can not provide meals for anyone other than those registered to be on site all weekend. You’ll need to take care of your own meals. We are only a mile from the charming hamlet of Lynwood Center, and three miles from the Bainbridge shopping district. You’ll have many choices there. We will, however, provide drink service- coffee, tea, and water, for everyone. At 5:00 p.m. Visitors need to say good-byes while the Glampers move toward supper and our evening activity. Q: What happens on Sunday? A: On Sunday we have our final breakfast together and say our good-byes. You’ll be checking out and getting shuttled to the ferry as needed. There will be a signup clipboard available over the weekend so we know when you will need a ride. The Plucky Crew will be packing up as well. Q: What are the evening activities? A: We will announce these details later, as we are not sure yet which activity will happen on what night. For certain, we must have our Fashion Show. We may keep some details secret so we can surprise you! We love surprises!! Q: How do I get there? Will I need a car? A: First off, please use the transportation links at the end of this Q&A for helpful info regarding airport, ground transportation, and ferry schedules. Glampers will need to get themselves to the Bainbridge Island Ferry dock. 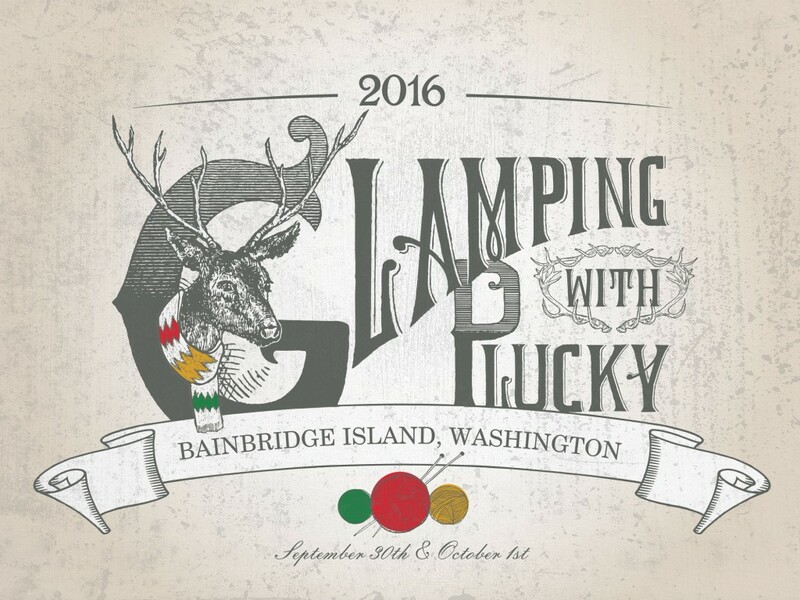 Glampers will be asked ahead of time via email whether or not they need to be shuttled by us for the last leg from the Bainbridge Ferry dock. Some of you may simply be driving, or renting a car at the airport– your choice. Visitors will need to arrange their own transportation to Bainbridge Island, and all the way to IslandWood. Having a car will be the most convenient. There is also an island shuttle bus service, but it will not be nearly as convenient as having your own vehicle. Q: What are my class options? A: The class descriptions are above this Q&A. You’ll indicate your choice on the registration form. Janine and Carson are teaching their class three times, so if you have a first choice teacher, you’ll have three possibilities of time. Lorilee will be teaching once. We hope everyone gets their first or second choice. Q: Is there any way to take a class as a Visitor? As a Glamper, do I have to take a class? A: Visitors- at this time, no. However, it is a future possibility. If, after the dust of registration settles there are still a few open seats in class, then we may elect to sell those seats. This will not be decided until well after registration. If we have spots to sell, we will sell them for $90 after making a general announcement on the blog. Additionally, if a Glamper wants to skip their class and sell it, that is fine with us. A class is valued at $90 and is included in the Glamper’s fee. Selling a class (or gifting it!) would be the Glamper’s responsibility. The Glamper will have to meet up to transfer their class ticket, or leave it at the registration desk with instructions. This year, Lorilee does not have to be notified of these changes ahead of time. Q: Why is there an additional $35 fee for Janine’s class? A: Fair Isle knitting requires lots of colors to make things beautiful and interesting. Janine wants you working with seven different colors of Oxford, and she wants you to have choices. Woo hoo! So, rather than asking you to buy seven skeins to make hats, we are creating kits of the yarn for you, to provide many color options for a good value. You’ll have enough to make two hats. Going to be some tasty meals served family style right there! Q: I have food allergies or a special diet. Will I be okay? Every Bite Matters. This simple-yet-intentional philosophy guides Chef Jim White’s approach to IslandWood dining. His menus showcase local, organic and sustainably sourced ingredients, simply prepared and thoughtfully presented. Whether you are looking for an elegant plated presentation or a nourishing family-style meal, IslandWood’s culinary team will bring your vision to life. Our service staff will extend this purposeful appreciation to each guest in the room. Q: I must have my Diet Coke (or, fill-in-the-blank)! May I? A: If there is any particular thing you must have and you want to bring your own supply, you may. There are grocery stores or other spots to get what you need before you arrive. Then stash it in the lodge refrigerator with your name on it. Q: I am a local. What are my options? A: You can either pop in as a day Visitor on Friday 1:00 – 5:00 and Saturday 10:00 – 5:00, or you can register for the full event and stay on site. There are no partial packages available that would give you a discount for sleeping at home or elsewhere. Q: What does it cost to be a Visitor? A: Nothing. Just come! We would love to have you! Q: Are there any other considerations I should know about if I am a Visitor? A: Yes. We will have complimentary coffee, tea and water, but we are not able to provide meals for you. It will be important to have transportation so that you can drive into Bainbridge or Lynwood Center for lunch. The facility does not permit take out foods brought onto the site. Q: How much can I hang out as a Visitor? A: All of those posted hours. You can walk the campus, go visit a Glamper’s lodge or room, or sit anywhere you like and knit. But you do have to depart from IslandWood when the shop closes as the rest of the gang has dinner and activities to attend. Q: I have mobility concerns. Will I be able to get around? A: Visitors should know the venue is handicap accessible. If you let us know what help you need, we will do whatever we can for you. Glampers will have the opportunity to make their specific needs known on their registration so we can understand and meet those needs. Q: As a Visitor, may I sleep over at a Glamper’s room if they have a spare mattress? A: No. Please respect this request. The facility will make up beds only for those registered. We will be penalized if there are unplanned guests. Q: If I am a Glamper, and got one of the single rooms with a queen bed, may I bring a guest to share my room? A: We can not allow for that either. The facility only has room for feeding and housing us as contracted. If our policy was to allow guests, it would decrease the number of Glampers we could serve. Q: I can’t attend as a Glamper, but I just really want to go to a dinner or fashion show. May I? A: We must limit all meals and parties only to those registered as Glampers. If a Glamper wants to forgo a dinner or an evening event, they can not transfer it to anyone. Only classes can be transferred, as mentioned above. Q: What happens if, after I register and pay, I find out that I can not attend? A: We will continue the policy from previous years. The Plucky Knitter will not issue a refund, but you are welcome to sell your spot to someone else. Those sharing rooms should discuss this to be aware of it as a possibility. Perhaps the group knows someone they’d like to sell the spot to. Perhaps the seller will need to post in the current “Destash/Trade” discussion thread in The Plucky Knitter Ravelry Group. In the end, those decisions and transactions are entirely up to the individual who originally purchased the spot. We suspect there will also be some people posting an “in search of” message in the current “ISO” discussion thread to try to attend. In years past we have had 2 – 3 people out of 110 need to sell their spot. So far, they have been able to do that successfully on their own. In other words, we do not process returns nor do we maintain a waiting list if the event is filled. Q: Is there an exercise room or pool? A: No, there is not. There are wide paths through the woods to explore and walk to your hearts content. Q: If Glamping, and I don’t have a car or a friend with a car, am I “stuck” at IslandWood all weekend? A: In our opinion, the town of Bainbridge is not to be missed. (See “About Bainbridge” below.) If you’d like to spend some time there, and did not work it in to your arrival or departure days, let us shuttle you back and forth into town. We’ll have a clipboard to sign up for rides. A walk into Lynwood Center is also one mile, one “hilly” mile. Q: Once registration is complete, can we all have a list of everyone attending? A: For privacy reasons, we will not be posting a list of attendees. The group will be receiving administrative emails from pluckycustomerservice@gmail.com and from lorilee@city-knitting.com ; we will use BCC for group communications. Each room group, however, will be getting an email to their group. In that situation, those in the room will have each other’s email address visible so you can share further contact information on your own to facilitate your plans. On site we will have a housing map available so you can find your friends, but we will not post it or make it available ahead of time. A: Hopefully just like the fall of 2015- warm, dry, clear, and gorgeous. We hope you have some clear weather so you can see the Olympics, the Cascades, and Mt. Rainier. You can expect highs around 65 F and overnight lows around 50 F, perfect for sweaters! Sweaters and a light rain jacket would serve you well. Q: What happens between registration and the event? A: Important information will be shared with registered Glampers via the email address you provide us when registering. There will likely be just a few communications over the summer and early fall. In the meantime, you can make your travel arrangements and consider adding on some time to visit Seattle! Q: How do I get any remaining questions answered? A: We will also try to keep up with questions on the Ravelry forums, but if you have an important question, be sure to direct that to pluckycustomerservice@gmail.com if it is in regards to payments, and to Lorilee@city-knitting.com if it is in regards to the facility, menu, rooming, transportation, classes, and the like. Do you still have a question? Email Lorilee@city-knitting.com so I can reply to you and add to this Q & A. We are enormously grateful for your interest, and hope to see you on the island! https://www.thepluckyknitter.com/wp-content/uploads/2017/05/new_small_logo@2x.png 0 0 Sarah https://www.thepluckyknitter.com/wp-content/uploads/2017/05/new_small_logo@2x.png Sarah2016-09-02 12:00:042016-09-02 14:07:53Glamping With Plucky! Is there a marketplace to shop for Plucky yarns for day visitors?